Aaron Lennon scored twice as Tottenham clinched a thumping win to climb away from the Premier League drop zone and leave Middlesbrough deeper in relegation trouble. 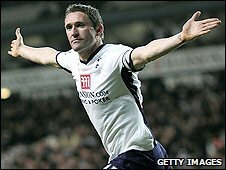 Robbie Keane opened the scoring with his first goal since returning to Spurs, after Michael Dawson had nodded on Luka Modric's in-swinging corner. Boro's Tuncay was denied by a tight offside decision before Modric set up Roman Pavlyuchenko for number two. Lennon ran clear to make it 3-0 before half-time, and he chipped in a well-taken fourth 11 minutes from time. For Spurs boss Harry Redknapp it was the perfect response to the disappointment of losing Sunday's Carling Cup final to Manchester United but, from the start, there was no danger of his side feeling sorry for themselves here. Home goalkeeper Heurelho Gomes was the first to be called into action, pushing away Stewart Downing's low shot after Benoit Assou-Ekotto had given the ball away on the edge of the area. But Tottenham were quickly into their stride and soon threatened when Didier Zokora piled forward down the right, allowing Jermaine Jenas to cross only for Lennon to volley wide. Despite that scare, Boro seemed happy to surrender space and possession down their left flank and they paid the price after eight minutes. David Wheater just managed to beat Keane to Lennon's dangerous cross but from the resulting corner, Dawson flicked the ball on at the near post for Keane to tap Spurs in front from close range. Boro's response was to come forward again and they did get the ball in the net only for Tuncay's strike to be ruled out for offside. The visitors' defensive problems continued, however, and they fell further behind after 14 minutes, this time thanks to some magic by Modric. His clever dummy bought him time as he ran on to Keane's cross and fired a perfect low cross for Pavlyuchenko to slide home, again from close range. The root of Middlesbrough's problems this season has been their lack of goals but they are usually solid enough at the back and their boss Gareth Southgate was clearly frustrated to see them opened up with such regularity. Boro hardly helped their cause when Julio Arca gave the ball to the impressive Modric soon afterwards and, when the Croatian fed Keane, it took a smart block by Brad Jones to stop Spurs adding to their lead. A third goal still looked likely, and it arrived before half-time thanks to more sloppy play by Southgate's side. Tottenham were allowed to spray the ball around the pitch before it came to Keane and he had time to turn and look up before threading a pass through for Lennon to supply a simple finish. Boro did improve after the break and, although they could not force Gomes into a save of note, they did hit the woodwork through Tuncay's cross. Spurs seemed content to sit on their lead and, if anything, they were on the backfoot for much of the second half. But there was still time for Lennon to have the final say on 79 minutes after another delightful move that saw substitute Darren Bent and Keane combine. The win moves Tottenham up to 12th but Boro, who face Everton in the FA Cup quarter-finals on Sunday, remain second-bottom with 10 games left. "He is in fantastic form, and you felt something would happen every time he got the ball. "The little fella is flying at the moment. He's learning the game - he's only a kid. He's got all the equipment." 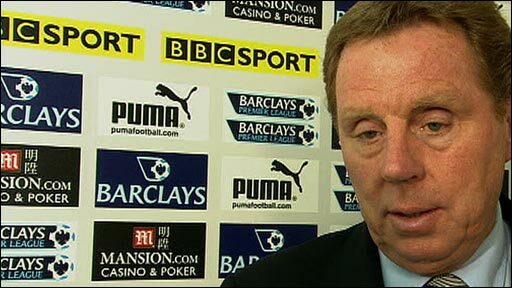 "We gave horrendous goals away. We are only able to compete if we are bang at it and we weren't today. "Spurs are a class act and when you allow them to play, they can tear you apart. We knew it would be hard but we let ourselves down." Tottenham: Gomes, Zokora, Dawson, Woodgate, Assou-Ekotto, Lennon, Palacios, Jenas (Huddlestone 64), Modric (O'Hara 73), Pavlyuchenko (Bent 53), Keane. Subs Not Used: Cudicini, Bentley, Chimbonda, Corluka. Goals: Keane 9, Pavlyuchenko 14, Lennon 40, 79. Middlesbrough: Jones, Hoyte (Adam Johnson 70), Wheater, Huth (Taylor 46), Pogatetz, O'Neil, Bates, Arca, Downing, Aliadiere (King 53), Sanli. Subs Not Used: Turnbull, Emnes, Alves, Walker. BBC Sport Player Rater man of the match: Tottenham's Robbie Keane 8.22 (on 90 minutes).